Getting organized is consistently on the top 10 list of New Years Resolutions. It’s now March, and we wonder how many people have actually stuck to this resolution. If getting organized at your shop is a concern, here are the top 3 reasons why you should be investing in production data management (PDM) through document control software for your manufacturing operation. 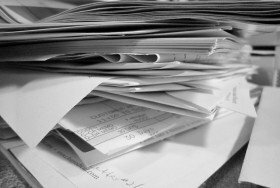 Reason1 – PDM helps you go paperless. If you are tired of buying file cabinets and losing track of documents, then PDM is the best way to manage incoming documents paperlessly. For the rest, we suggest scanning them, making sure they are properly saved, then safely shredding them. Also, an approach of truly brilliant people that you can adopt into your routine is called the “touch only once” rule – when a piece of paper is brought to you, whether a file or a piece of mail, deal with it immediately, when at all possible, so it is off your plate. Reason 2 – PDM makes your job easier. Using manufacturing-driven, open architecture PDM document control software can do more than you might have imagined. It is designed to organize & control CNC programs, setup sheets, safety procedures, quality documents, & other files with complete document control plus file revision control. PDM can also be integrated with other software, such as DNC software and CNC editor. Keep in touch with your Quality and Engineering Departments, while feeling assured that if an audit happens, you’re covered. Reason 3 – Simply put, it’s the law. Granted, while it is not required that you have adigitall organization system like PDM for your important documentation, you are required to keep track of the documents. If keeping tidy isn’t motivation enough, then the law definitely should be. As a manufacturer, you need to abide by legal code 21 CFR 820.40 – establishing and maintaining procedures to control documents (more info here). As a business, you need to keep tax documents and any related records for anywhere from three to seven years. Employment records need to be kept for a minimum of a year and payroll records kept a minimum of three years. If you are ready to see what PDM can do for you, or aim for better OEE, request a PDM software demo with Shop Floor Automations. Call (877) 611-5825, or chat with us via one of our social media channels.